My husband was in Syracuse IN for a funeral and froze a pizza from pizza king to bring back home to Mebane NC!! That's how much we love pizza king!! I love the service the food is done fast... Just friendly and happy place. I travel from Goshen to you!!!! Stopped in for lunch today and my goodness, amazing pizza - tangy sauce, plenty of toppings, hand-tossed crisp crust and tasted like fontina cheese - exceptional! favorite place to eat in the Midwest! its our favorite and are never disappointed its great ! You can't be in Syracuse without enjoying and loving Pizza King. We absolutely LOVE this Pizza King. My family and I drive down from Elkhart just to come to Pizza King. We've only ever had a problem once, about a year ago. Maria the manager was very kind and went above and beyond to make coming here a great experience. 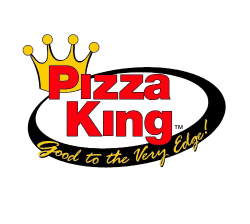 The staff keeps the place clean and I would recommend this restaurant anyone looking for great pizza and a great place to dine.